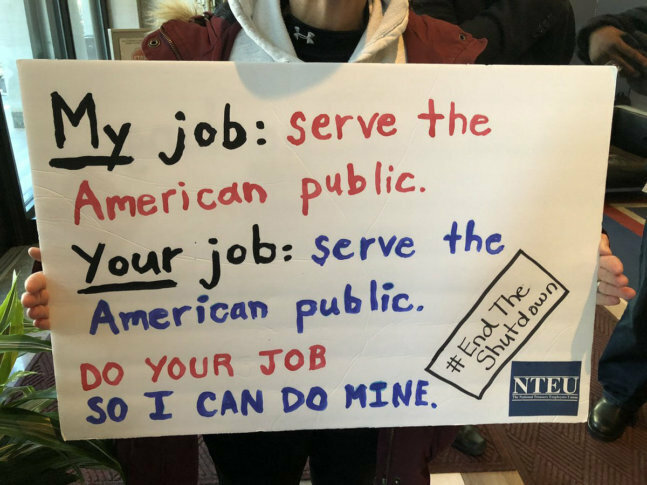 WASHINGTON — Claiming national leaders are playing politics with people’s lives, thousands gathered Thursday at AFL-CIO headquarters in downtown D.C. for a rally to demand an end to the partial government shutdown. Within sight of the White House, federal employees and contract workers belonging to two dozen U.S. labor unions gathered along 16th Street Northwest, outside AFL-CIO headquarters. Among them was Lila Johnson, 71, of Hagerstown, Maryland, who works part time as a custodial services contractor for the Department of Agriculture. “Everybody is depressed now because they don’t know when they can go back to work,” Johnson said. She’s raising two boys, 15 and 7 years old, and she can’t afford not to be paid, she said. Marrone is a park guide for the National Park Service at Oxon Hill Farm, where she milks cows, drives a tractor and does farm demonstrations for school groups and families. The concept of what makes a job essential is a bit different for Jim Salamon of Germantown, Maryland, whose developmentally disabled son is furloughed from the Curtis Bay Coast Guard Yard in Baltimore. “He’s been there for 17 years. He really likes it; this is messing him up,” Salamon said. Talten Hall, of Silver Spring, Maryland, was rallying not far from his typical job site. He’s a National Park Service worker assigned to President’s Park, which includes the park lands surrounding the White House. “I just want to get back to work,” Hall said, adding that he doesn’t care about the political issues surrounding the shutdown.